Early in 2017, the U.S. Virgin Islands was facing massive structural deficits, fast-rising debt, multiple ratings downgrades, an inability to borrow and no clear path to solvency. Hurricanes Irma and Maria have dramatically worsened the series of budget crises facing the U.S. Virgin Islands, with the V.I. government projecting a loss of $1.5 billion in revenues over the next three years. 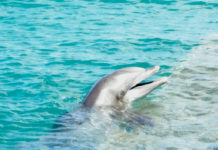 Virgin Islands officials have lobbied for those changes for many years, to no avail. But since Hurricanes Irma and Maria hit the islands in September, some members of Congress, at least on the Democratic side, have sounded more supportive. Hurricane relief-related hearings have given territorial officials a chance to press their case before a more attentive audience. At a Nov. 14 hearing before the U.S. Senate Energy and Natural Resources Committee, Sen. Maria Cantwell (D-WA), said “inequitable treatment under Medicaid and Congress’s haphazard treatment of territories under the tax code have dramatically harmed these economies.” Mapp also testified at length to the committee about the Medicaid and Medicare issues that day. Cap Cash Gifts to Rum Makers? The V.I. 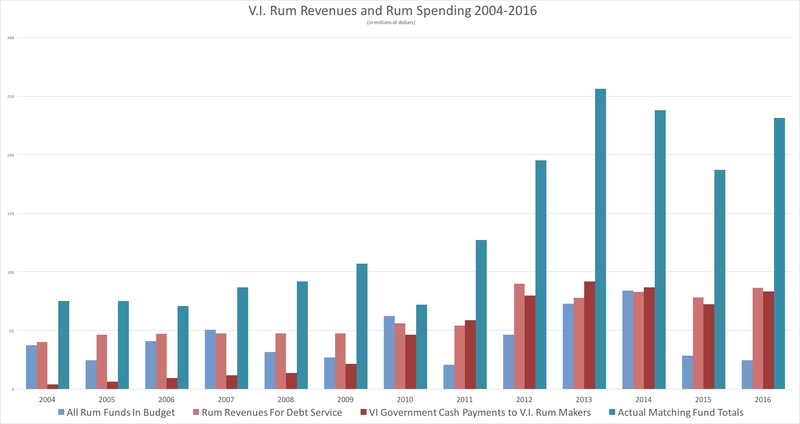 government gives about $100 million per year in straight cash payments to its two rum makers to entice them not to leave. Those companies also pay effectively no local taxes beyond the personal income from fewer than 50 employees. V.I. officials are actually bound by contract not only not to change those subsidies but to actively oppose any efforts by Congress to change them. (See Related Links: “The V.I. 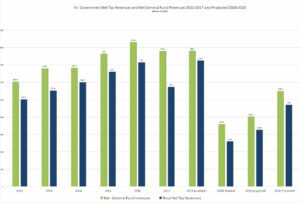 Budget Crisis: Part 15, Rum and Congress.”) Puerto Rico gives away even more to its larger rum industry. 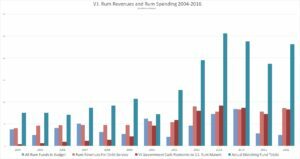 Even if there were no legal obligation to lobby for the subsidies, if the USVI or Puerto Rico unilaterally cut subsidies, all the bulk rum sales would immediately flow to the territory that had slightly cheaper rum due to higher subsidies. The two territories are bound together that way. Only Congress can make the changes and it would have to do it despite V.I. officials lobbying against it. But the mood in Congress seems to be in the opposite direction. Congress has passed a major cut in the corporate tax rate, despite record corporate profits and record levels of cash on hand. But conditions in Puerto Rico are dire and if nothing is done, the humanitarian crisis may grow worse than members of Congress can ignore. 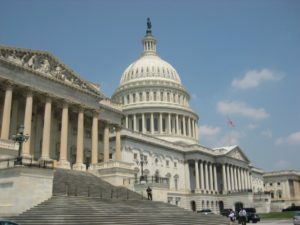 A choice between subsidy caps and giving out hundreds of millions of dollars in direct aid might move Congress. Cash assistance would be just as good of course. Should PROMESA Be Expanded To Include a VIOMESA? The U.S. Virgin Islands is looking at a budget shortfall of almost half a billion this year, and at least $200 million even after after getting disaster loans. It spends about $177 million per year on debt service. V.I. officials have said many times this year that the territory has never missed a payment. That is true. Puerto Rico never missed a payment either. Until it did. What happens if the territory defaults on its debt service instead of gutting schools or police? Its bond ratings will become junk. It will be downgraded again, to “default.” It will be functionally bankrupt. But unlike stateside municipalities, the territory does not have access to bankruptcy protections. Puerto Rico’s protection was removed by an obscure 1984 change in federal law. The USVI apparently never had bankruptcy protections. Default would mean the USVI will definitely not be able to borrow. But it already cannot borrow. Potentially, other industries might leave due to the bad business environment. But that mostly means either the rum distilleries – which have great incentives to stay – or companies that are here to get tax breaks that they will lose if they leave. Lenders would sue and likely win, since no one disputes the debts are owed. But the established procedures and protections of U.S. Bankruptcy Court would not apply. If a person or a private company stops paying lenders and a court enters a judgment against them, in the most severe situation, U.S. Marshals could conceivably take control of assets by force. But taking control of the territory by court order is not so straightforward. It raises legal issues of status and sovereignty. And what would the court do? Sell off territory’s school buildings? Eight of them were condemned after the hurricanes. Who would buy them? The only way lenders will actually get paid is if there is a functioning V.I. government and economy, generating revenue that can be partially diverted to debt service. 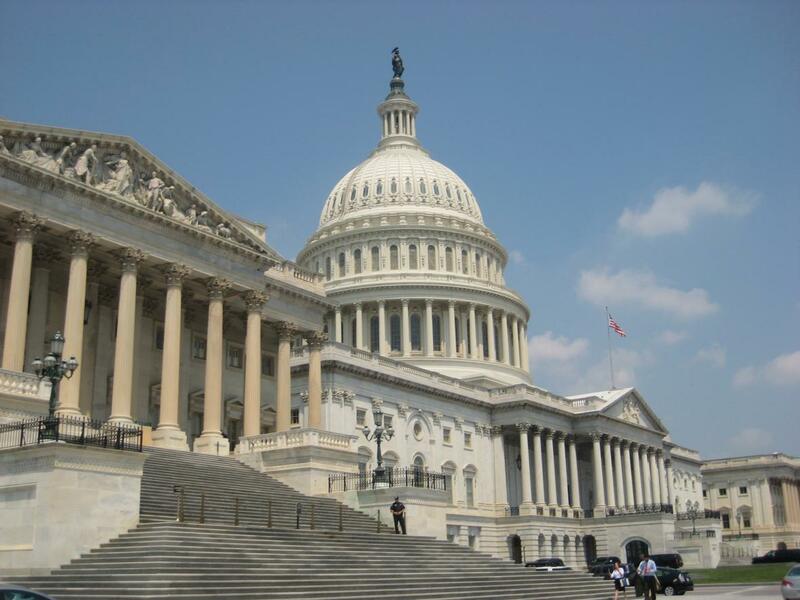 After Puerto Rico stopped making debt service payments, Congress in 2016 enacted PROMESA – the Puerto Rico Oversight, Management and Economic Stability Act. That law created a powerful oversight board with broad authority to restructure Puerto Rico’s debt and affect the budgetary decisions of the Puerto Rico government. It also protects Puerto Rico from a more chaotic restructuring through lender lawsuits. At the time, Mapp and the V.I. congressional representative, Del. 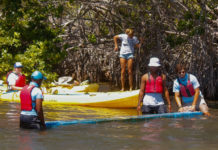 Stacey Plaskett (D-VI) both opposed extending the measure to potentially include the USVI. They both worried about its impact on USVI borrowing. In 2016, Plaskett said the fact that the territory secures its bonds with federal rum tax revenues and local gross receipts taxes and cannot declare bankruptcy help keeps rates down. Being able to declare bankruptcy would “create a much greater risk to creditors, which will raise the interest rates we pay. … Right now ours is about 4 percent while Puerto Rico is 9 percent,” she said. The USVI was unable to borrow even before the storm. In between the two hurricanes, Standard and Poor announced it would no longer even rate the territory’s credit-worthiness, saying it could not get accurate information from the V.I. government to even make an informed judgment. (See Related Links: “V.I. Lack of Cooperation on Data Worries S&P Rating Agency.”) If we cannot borrow anyway, is borrowing still a concern? PROMESA is unpopular today in Puerto Rico because it takes sovereignty away from the local government. Some see it as too friendly to debtors and too draconian about public needs. In August, Puerto Rico Gov. Ricardo Rosselló (D-PR) defied the PROMESA Financial Oversight and Management Board’s order to furlough government employees two days per month. The FOMB sued Rosselló to enforce the order but has reportedly dropped the suit in the wake of Hurricane Maria. Rosselló also defied the board in November, issuing $113 million in Christmas bonuses to government employees, according to the Washington Post. Lenders are also unhappy with PROMESA and one big hedge fund has joined a lawsuit to try to declare the FOMB unconstitutional. Whether PROMESA will ultimately achieve its goals is still an open question. The V.I. Legislature will hear from Mapp’s financial team again in the new year, after some more disaster assistance and loan proceeds arrive. Maybe there is something surprising in the works. 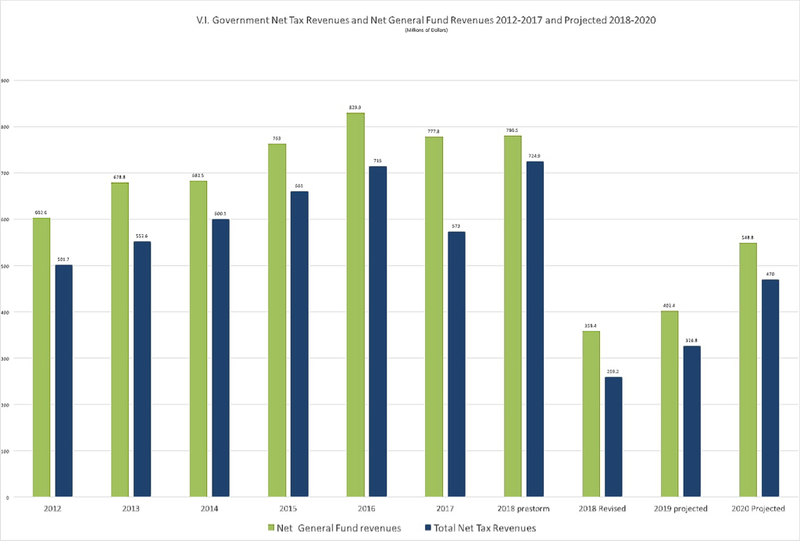 Maybe early projections of a $1.5 billion drop in USVI tax revenues will somehow turn out to be vastly exaggerated. Maybe Congress will open the purse strings and send one or two or four billion dollars. Four billion dollars would almost wipe out the territory’s debt and pension shortfall too. If not, brace for impact.